Error: "You do not have sufficient privileges to complete this installation for all users of the machine"
You do not have sufficient privileges to complete this installation for all users of the machine. 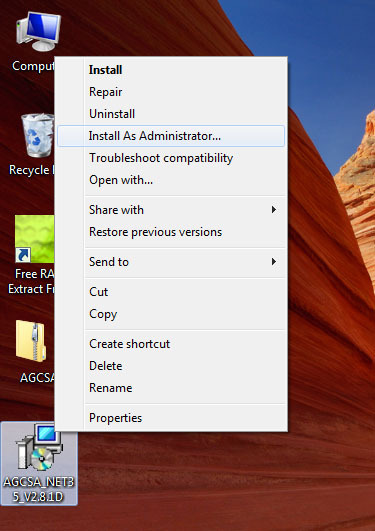 Log on as administrator and then retry this installation. This is due to the fact that Microsoft has implemented User Access Control (UAC) in the aforementioned operating systems. Once the Windows Registry has been modified using the Install_As_Administrator.Reg patch you can right click on any Windows Installer (*. msi) file and select the option Install As Administrator and the .msi file will run using elevated permissions (Administrator Permissions). The only other possible solution is to disable User Access Control (UAC) completely which will require several reboots of the system. Special thanks to Mitch Tulloch http://www.mtit.com/mitch and www.windowsnetworking.com for posting this solution online.